Faruqi & Faruqi Law Blog: Faruqi & Faruqi Alert: CorMedix, Inc.
Faruqi & Faruqi, LLP, a leading national securities law firm, reminds investors in CorMedix, Inc. (“CorMedix” or the “Company”) (NYSE: CRMD) of the September 4, 2015 deadline to seek the role of lead plaintiff in a federal securities class action lawsuit filed against the Company and certain officers. 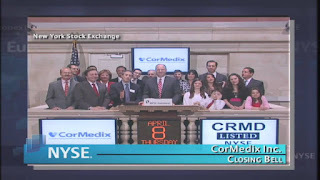 The lawsuit has been filed in the United States District Court, District of New Jersey, on behalf of all those who purchased CorMedix securities between March 12, 2011 and June 29, 2015 (the “Class Period”). The investigation focuses on whether the Company and its executives violated federal securities laws by failing to disclose that (1) the Company had utilized stock promoters seeking to inflate the Company’s share price and (2) the Company exaggerated the effectiveness of its sole drug product, Neutrolin, as well as the drug’s performance in clinical trials. The information was made public by an article published on June 29, 2015, on Seeking Alpha.com. The article also stated that certain officers involved in the formation of the Company had faced previous fraud accusations. As a result of this article, Company shares declined $0.81 per share to close at $4.05 per share on June 29, 2015, a drop of over 16.6% on unusually heavy volume. If you invested in CorMedix stock or options between March 12, 2011 and June 29, 2015 and would like to discuss your legal rights, please contact us by calling Richard Gonnello toll free at 877-247-4292 or at 212-983-9330 or by sending an e-mail to rgonnello@faruqilaw.com. Faruqi & Faruqi, LLP also encourages anyone with information regarding CorMedix’s conduct to contact the firm, including whistleblowers, former employees, shareholders and others.